Greater Efficiency: Work faster with fewer key strokes. DocSavi also ensures that fewer errors are made and documents are not lost. Synchronizes Metadata between Oracle and your Content Management system: When a user changes a property in Oracle, DocSavi will automatically update the metadata in the Content Management system. User-friendly and Configurable: DocSavi is easily configured by users via the Administrative Console. EBS Upgrade Proof: A stand-alone schema ensures forward and backward compatibility with future Oracle updates. Excellent Personalized Support: Experts in Oracle EBS, Capture/OCR and Content Management, the CMMC team deploys and provides ongoing support for your solution. 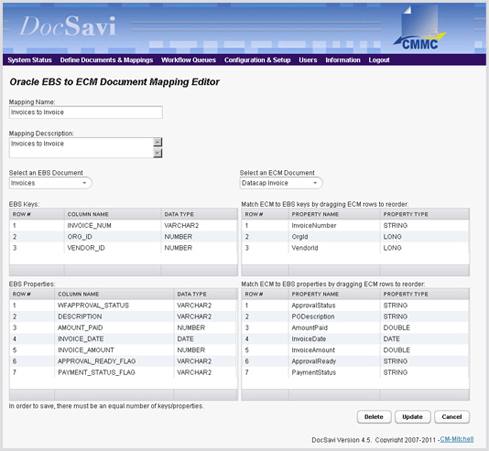 Lower Cost of Ownership: DocSavi is a sophisticated mapping tool, and not a separate stand-alone system.